Description: Clean geometric lines, structural details and meticulous attention to quality are hallmarks of this lighting fixture. This appealing Mission styled pendant features colorful interlocking blocks of Green and Sunburst art glass with Bark Brown Granite Glass to form stylized wheat stalks on a Creamy Beige background. 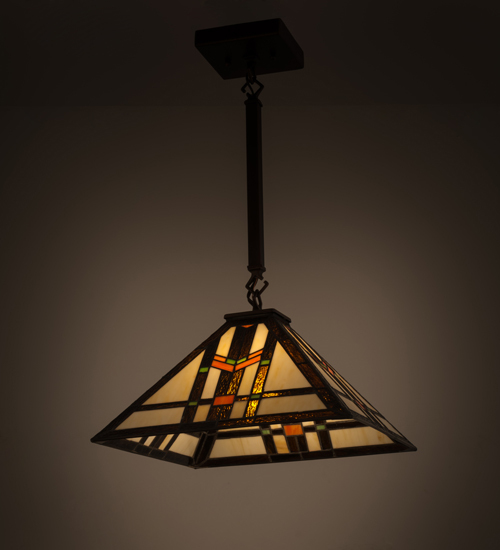 The handcrafted art glass shade is embraced by hardware finished in Mahogany Bronze. The perfect illuminating centerpiece to enhance any decor for fine homes, restaurants, boutiques and hotels. Custom sizes, styles, colors and dimmable energy efficient lamping options are available. The fixture is UL and cUL listed for damp and dry listings.